on the drapery of the shoulder is a small K, the initial of Kugler, the German artist, who cut the die. The Legends are: "GEORGIUS III . D. G. REX." (King George III by the Grace of God). Reverse: The figure of Britannia seated upon a rock, in her her left hand a trident, and, in her right hand she holds an Olive branch; waves wash the rock on which she sits; a ship sailing to the right is seen in the distance, while the word "SOHO," the place of their manufacture, is on the rock at the base of the shield. Legends: " BRITANNIA." Exergues: Date of the year of issue. References: KM# 618, Sp# 3777. Küchler was born in Flanders around 1740. He first came to England in March 1793, where he was employed as an engraver at the Soho Mint, owned by the notable manufacturer Matthew Boulton. He was Boulton's sole artist for designing and die-cutting, and produced the designs for various coins, medals and tokens, including the copper "cartwheel" pennies and twopences, and medals depicting the Battle of Trafalgar, Louis XVI and Marie Antoinette. He later left the Mint, but continued to be employed by Boulton's firm in London until his death. Küchler died in Handsworth in 1810. Among the pieces most frequently received for examination from members of the public are the large copper pennies and twopences of 1797, known as ‘cartwheels’ because of their huge size. The two coins bear similar designs. 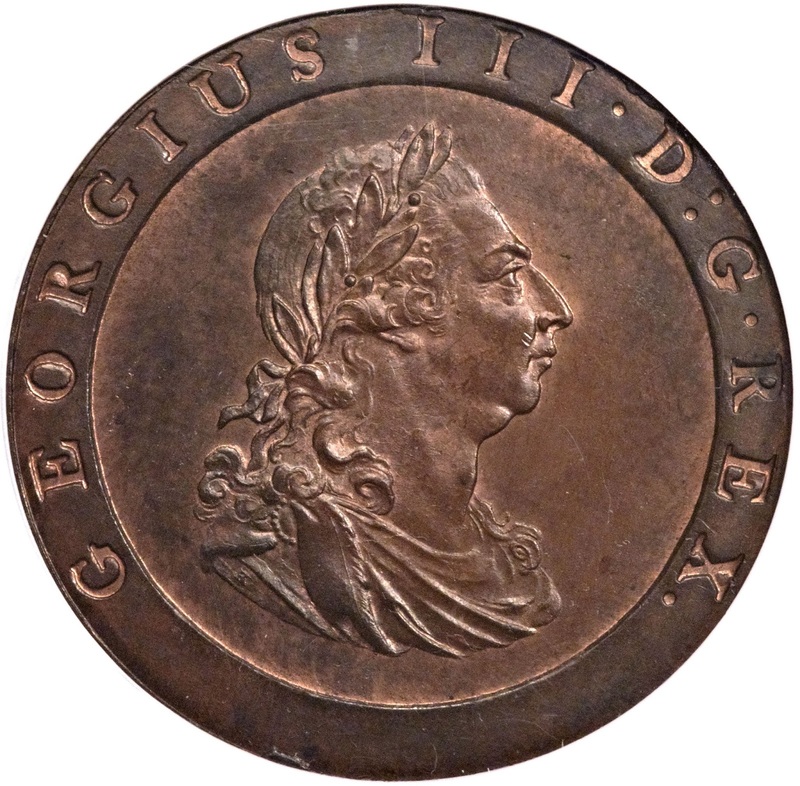 On one side appears the head of George III, facing right and wearing a wreath, together with the words GEORGIUS III.D:G.REX. On the lowest fold of the drapery at the base of the effigy is the initial K, indicating that the design is the work of the German engraver Kuchler. On the other side (also engraved by Kuchler) is shown the seated figure of Britannia, together with the word BRITANNIA and the date 1797. The letters are incuse (or sunk) and have been placed on a broad raised rim in an attempt to prevent undue wear and lessen the risk of counterfeiting. 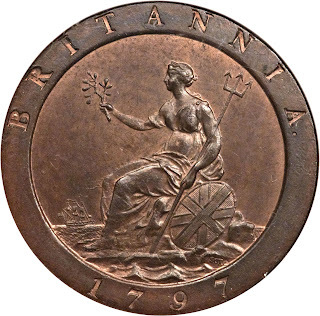 The coins were not struck by the Royal Mint but by Matthew Boulton at his private Soho Mint in Birmingham, and the name of the mint can, in fact, be seen on the coins just below Britannia’s shield. They were made legal tender for amounts of up to one shilling by a proclamation of 26 July 1797, which also specified that the penny should weigh one ounce and the twopence two ounces. The object of making them so heavy was that their intrinsic value should correspond as nearly as possible to their face value: in other words, their cost of production (copper plus workmanship) was to be a penny in one case and twopence in the other. The diameter of the penny measures 1.4 inches and that of the twopence 1.6 inches. It is believed that approximately 720,000 twopences and nearly 44,000,000 pennies were issued, all bearing the date 1797. Consequently the penny is a very common piece and the twopence not particularly hard to come by.